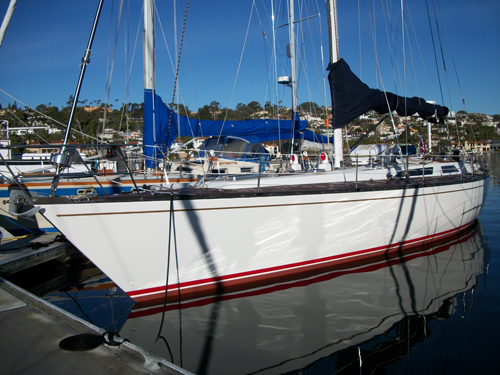 55' Baltic sailboat | Christian & Co. The vessel was inspected while afloat. Hull construction material is molded fiberglass (reportedly epoxy vacuum bag). Deck is constructed of molded fiberglass with blue down teak decks and particle nonskid. Above deck structures are constructed of molded fiberglass. Bulkheads are constructed of plywood. Overall condition of the hull structure appears good with no noticeable fractures or delaminated fiberglass tabbings. The vessel’s weight 50,000 lbs per previous survey haul out. Exterior rails and hardware appear good – excellent. Mast, mast step, standing rigging and chain plates, where visible, appear excellent. All standing rigging is newly replaced stainless steel rod. The mast and boom were removed and painted and running rigging cordage is new. Cosmetic condition of vessel appears excellent externally as teak decks are new and topside paint and nonskid new. Cosmetic condition of the vessel internally is satisfactory internally. Vessel’s external colors are white with a red boot stripe and gold sheer stripe. Below waterline through hull fittings appear good and all valves were serviced while hauled. The vessel is equipped with one manual and one electric/automatic bilge pumps that appear good except the automatic switch is not secured and the bilge is holding minimal standing water. The ventilation system consists of one forced air and natural ventilation and appears satisfactory except the lazarette blower is not secured and is straining the power supply wires. General housekeeping appears satisfactory (various items have yet to be stowed from refurbishment project). Engine’s external surfaces are excellent (engine is new). Motor mounts appear excellent. Cooling system appears excellent. Fuel system and components appear excellent. Exhaust system and components appear excellent (new exhaust hose). Electrical system and components appear excellent. Engine control system appears good and shaft log appears excellent. Steering control system appears good and rudder port appears good. Propulsion components were not inspected externally. Generator surfaces and motor mounts appear excellent (new). Generator’s peripheral components and systems appear excellent. Waste system and components appear satisfactory – good. General service seawater systems appear satisfactory but the general service hose connections at the raw water manifold have corroded clamps and the refrigeration raw water supply valve is corroded (currently closed and not in service). There is approximately a 60 gallon capacity in two stainless steel tanks located below the port and starboard settees. Fuel tank surfaces, where visible, appear satisfactory. The client reportedly had the tanks cleaned and inspected after purchase and found the interiors epoxy coated and in good condition. The fuel fill, vent, feed and return lines and components appear satisfactory where visible. Fuel shutoff valves are located at the filter and tanks and appear good. The AC shore cord, inlet and connections appear good. The AC wiring and outlets appear good (the client has installed a new shore power transformer). The AC main feeds are protected with circuit breakers. Battery arrangement appears good. Batteries are newly replaced with AGM type batteries. Batteries are equipped with disconnect switches. DC wiring appears good. Circuit protection for the AC and DC branch system appears good – excellent (currently installing a new AC main circuit breaker panel). Wire terminations and connections appear good. Wire organization and arrangement appears satisfactory. Vessel has five portable fire extinguishers with expired certification. Vessel has no fixed fire suppression system. The safety components include: ten (two inflatable harnesses) PFDs and two throwable PFDs; distress flares with current certification; one life raft with current certification; suitable first aid kit; four anchors with chain and line and appears good. Navigational and anchor lights appear excellent. Other safety equipment includes dual fuel filters with vacuum gauge, MOB pole, West Marine eight person life raft with serial # XDCAWC23B707, radar reflector, rigging cutters, sextant, handheld GPS, ditch bag with portable water maker, tapered wood bungs, loud hailer with auto signaling, AIS transmitter/receiver. Vessel is equipped with LP gas that fuels the range. The client has purchased new fiberglass tanks and built a sealed storage compartment in the lazarette. Ventilation appears good. Feed line is equipped with a reducing regulator, a pressure gauge and an electric shutoff solenoid and feed lines appear satisfactory. The client stated that he does have a propane sniffer that is pending installation. The vessel was inspected at a temporary slip location. Line condition and arrangement appears good. Boarding hazards appear insignificant. All entry points are reportedly kept locked. The vessel is a fiberglass production cutter rigged performance cruiser equipped with an auxiliary power diesel engine. The client reportedly purchased the vessel approximately ten months ago and since purchase has performed major upgrades of the vessel including: new exterior paint, new teak decks, stripping of hull bottom paint and new epoxy barrier coat and anti fouling paint, new standing rigging, painting of the mast and boom, new engine, new generator, installation of a new isolation transformer, new inverter, upgraded battery bank, new single side band and VHF, life raft, ASI system, replaced all exterior and navigation lights with LED lights, upgrading distribution panel and entertainment system. The vessel is in “as new” condition externally and interior finishes are basically original but does have new mattresses throughout. The client is extremely knowledgeable of all vessel systems and would be competent to handle most any situation at sea. The vessel is structurally and mechanically sound and suitably equipped for its intended purpose as a coastal or blue water cruiser. ACTUAL CASH VALUE- $425,000 approx. NEW REPLACEMENT VALUE – $1,250,000 approx. 1. Secure the bilge pump automatic switch. 2. Secure the lazarette forced air ventilation blower. 3. Provide access for the forward head’s through hull below the cabinet (shelves require cutting). 4. Have the portable fire extinguishers inspected and tagged as recommended by N.F.P.A.